A new appreciation of Durkheim, now into its fourth decade, has extended our grasp of his intellectual ambitions beyond standard academic boundaries. 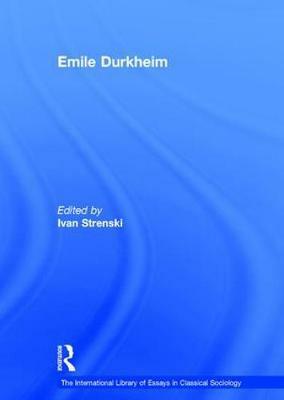 Contributions to this revival of interest in Durkheim, many secreted away in obscure periodicals, are well worth being recognized for their unqualified excellence in helping us to uncover the original Durkheimian intellectual project in all its interdisciplinary complexity. Besides classic Durkheimian subjects such as religion, social solidarity and suicide, these studies bring to light Durkheim's intellectual inquiry into political theory, comparative ethnology, social reconstruction, questions of civil society, and his articulation of an updated individualism in conversation with Marx, Hegel, Spencer and others. Authors who have helped us attain this more rounded conception of the Durkheimian project include such well-known figures as Robert N. Bellah, Robert Alun Jones, Anthony Giddens, W. S. F. Pickering and Edward Tiryakian. More than matching these contributions are the surprising writings by authors from across the disciplines, including such contemporaries of Durkheim as historian Henri Berr and theologian Alfred Loisy, as well as modern-day writers who deserve to be much better known, such as philosopher, John Brooks III or historian John Bossy. Although this collection is overwhelmingly drawn from sources in English, two classic critical pieces by French contemporaries of Durkheim enhance the value of this anthology. Ivan Strenski is Holstein Family and Community Professor of Religious Studies at the University of California, Riverside. He is the author of nine books including Durkheim and the Jews of France (University of Chicago Press, 1997) and The New Durkheim: Essays on Philosophy, Religious Identity and the Politics of Knowledge (Rutgers University Press, 2006). Robert N. Bellah, John I. Brooks III, Neil Gross, D. Nemedi, W.S.F. Pickering, S.G. Stedman Jones, Ivan Strenski, Edward A. Tiryakian, Philippe Besnard, M.J. Hawkins, Robert Alun Jones, Neville Layne, Victor Karady, W. Paul Vogt, W.D. Halls, Mark S. Cladis, Louis M. Greenberg, Anthony Giddens, Bernard Lacroix, Steven Lukes, Josep R. Llobera.